Google is reportedly getting ready to launch some new hardware at its October 9 hardware event and we just learned a lot more about a new product that might be launching. It was rumored that Google was working on its own Smart Display, now we’ve got images of the Google Home Hub and details about its price tag via a report from AndroidAuthority. The device certainly looks like a Google Home product with all the fabric anyone could ask for and then far, far more on top of it. 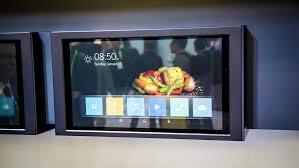 It’s rocking a 7-inch screen and will cost just $149, which is quite a bit cheaper than the 8-inch Lenovo Smart Display which is currently the cheapest option at $199 while its 10-inch varietal ships for $249 as does the stereo-speakered JBL Link View. Having played around with Lenovo’s product, Google has some very pretty software for their Smart Displays but there are some strange quirks given that the screen is basically superfluous by design as it can’t ever assumed that the speaker can see the screen when an answer is being given. Google has their work cut out for them, but it might be in their best interest to introduce some light touch interactions that allow you to perform more actions without speaking at all, otherwise the screen is always going to feel a bit misplaced aside from pulling up a YouTube video or watching a slideshow. What will be interesting to see is what exclusive software wizardry the device has, if anything. The report details that the device will not have a camera like other Smart Displays which is a bit funny given that the whole point of it was to bolster its Duo video call service, which Google seems to realize either isn’t worth the inexpensive components or the potential privacy overhead. If the rumored price of $149 proves accurate and Google opts for most of the internals that the partner Smart Displays have, this will be a very cool device at a great deal that will not get used very often. It is wildly unclear what the point is of this product vertical, and without breaking it free of its software prison Google seems to be missing a big opportunity that could be fulfilled by whatever the big G’s competitors eventually release. This report seems pretty solid, but we only have to wait a couple more weeks to see what Google has in store, Owojela's Blog will be keeping up with the details at the company’s Pixel 3 hardware event on October 9.